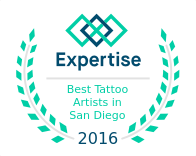 Jason is drawn to styles of traditional, neo-traditional, and realism but is skilled and proficient in most styles of tattooing. Whether his next tattoo is small to medium or a custom large design he is excited to hear the story behind each, customizing each piece to the person. Jason understands visual arts, esthetics, and a clients desire for the perfect piece. To schedule a consultation or tattoo appointment with Jason, please call the shop or use the website contact form and our scheduling manager will get you set up with an appointment.